Inbound marketing is a big category. And the number of tactics you employ to leverage your inbound marketing for sales is probably wide ranging. Depending on your marketing objectives, you may find some channels are necessary to explore while others, not so much. But I think we can all agree that these days, mobile matters. You know inbound marketing is the combination of tactics used to attract customers to your brand through messaging, offers, and interactions that are relevant or helpful, but what makes inbound marketing specific to mobile? 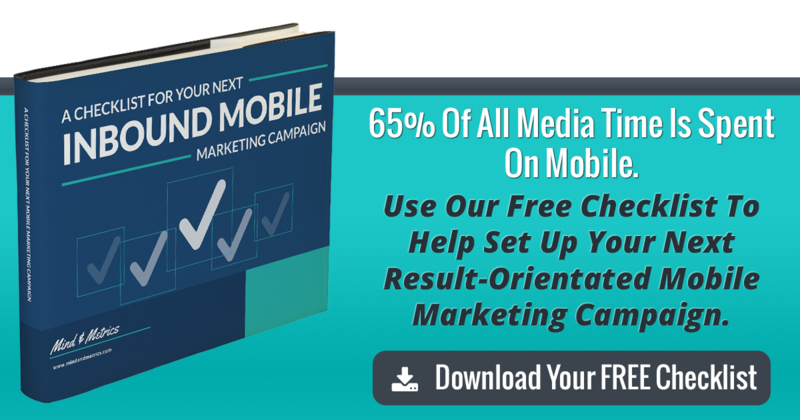 Inbound mobile marketing is inbound marketing translated to a smartphone. It’s content that’s designed specifically for mobile users in the hopes that their experience or interaction with your marketing messaging is flawless according to their expectations (i.e. it doesn’t feel intrusive, but actually feels useful!). This can mean mobile-responsive or having a separate mobile site, but either way it’s important. If your site is not mobile friendly, all of the content you’ve worked so hard to produce will be difficult, if not impossible, to view from a mobile phone. That’s bad news when 68% of US adults are smartphone users. Not sure how to tell? Google was kind enough to create a little test that will let you know how your site ranks in terms of the mobile experience. That is, make sure buttons, navigation menus, and links are visible and able to be clicked with precision, even on a small screen. They may seem like a good idea for aggressive lead capturing or content offers, but mobile screen-takeover pop ins do not make for a great user experience. Not only has Google begun to dock sites for this in search, but chances are it will lead to higher bounce rates and more frustrated consumers. If you must have one, consider a version that slides in from the bottom of the screen, or sticks to the top, and doesn’t immediately obstruct the website content from view and/or navigation. With or without a mobile-optimized site, you can surely reach your customers on their phones via social channels. Nearly 20% of a smartphone users’ time on-phone is devoted to social media–tough to ignore. Since these platforms have already done the hard labor around making their sites mobile friendly (likely in app form), why not take advantage of the possibilities they offer. In general, you should have a social media presence, somewhere. By posting or publishing content on the social channels that are most relevant to your business, you will gain a following, naturally, of people who identify with your brand or product. This will help you begin to build loyalty and trust without paying a dime. Organic traffic and engagement, though important and beneficial, has become increasingly more difficult to build. However, the options for advertising on most platforms are extensive and customizable, not to mention relatively inexpensive (if proper attention is paid–forgive the pun). You have the flexibility to get hyper-specific about which audiences see your paid content and at what rate your ad budget is spent. You can even be selective in choosing to run specific ad content to mobile-users only, an added benefit when exploring ways to bolster your mobile marketing game. Social media, from a business standpoint, also gives you the opportunity to learn a great deal about your followers. With just a little leg work, you can get an idea of what other brands your followers follow, what they express interest in, what kind of content they hope to see from your brand (do they love videos, or favor blog post announcements? ), and more. You can then take these learnings and apply them to other aspects of your marketing strategy. You’ll reach a more receptive audience and your budget will consequently go much further. Make it work for you! You’re receiving data from all angles at this point, capturing it from your social followers (see above), gathering it from purchasing behaviors, learning from email marketing campaigns and paid advertising, so now it’s time to action it. Particularly in the context of mobile, there are ample opportunities to create and leverage highly personalized experiences depending on the tools you’re using to execute on your marketing strategy. Using location information, for example, may be a good way to send push notifications to your customers at crucial moments in their purchase journey. For example, if you sell women’s outerwear in New York, and it’s raining across the city, why not text customers as they pass your storefront to alert them to merchandise and offers–maybe an umbrella or a raincoat–that might be of particular interest at that very specific moment in time. Not only does the likelihood of a purchase skyrocket in a situation such as this, but brand affinity and loyalty are likely to also improve as customers will appreciate the carefully crafted and personalized prompt. Similarly, you should pay attention to the ways customers are interacting with your brand across devices. Consider how the behavior is similar and how it is different, but more importantly, make sure you’re following particular actions with content that makes sense. Because a conversion doesn’t happen on desktop, certainly doesn’t mean it won’t ever happen, so carry on with the appropriate purchase journey from desktop to phone. People aren’t just browsing the web on their phones, they’re buying. It’s projected that in 2017 more than half of digital purchasers will make at least one purchase online. So to help reach your increase sales marketing objective, consider how features like fewer steps to purchase or a more intuitive navigation specific to mobile users will get you there. Finally, test, assess, and adjust what you’re doing to reach new (or convert existing) customers on mobile. Try a/b testing pages on your website for ease of mobile use, test push notifications, and continue to learn by tracking behavior, to name a few; there’s always room for improvement. By creating and distributing content in a mobile-friendly fashion, in the right place, at the right time you’ll reap the benefits of increased sales and improved inbound mobile marketing performance. Have questions about how to support your marketing objectives and up your sales with inbound mobile marketing? Get in touch!